Sarees are forever in fashion and are diversely worn in countries like India, Bangladesh, plus Pakistan. Womens Sarees are used as a casual wear clothing in many parts of the world, as well as a special festive wear clothing. Just like their use, latest saree designs and styles are diverse as well. It is the type of womens dress that suits all the body shapes and gives a very stylishly chic look to anyone. There are multiple ways you can wear a saree dress, depending on your personal liking, similarly, the sarees are also available as your traditional saree, with a blouse and a wrap-up fabric, plus a saree dress that is called a two-piece, which looks similar to a ghagra choli. You can find a variety of different sarees for sale online and in-store, so there are a few tips for buying womens saree dresses that you should always keep in mind. There is a wide array of saree fabrics available in the market, and ranging from the banarsi fabric to silk, net to even chunri material, the possibilities are endless. Always opt for a flowy fabric if you want your saree to flatter your body shape. The flowy the fabric is, the nicer it will look on your curves, like a chiffon saree, net saree or silk saree is a better option than a cotton saree since the cotton fabric tends to puff up and not look flattering on every body shape. Secondly, there are different types of saree fabrics, which are suited for different weathers, like a velvet saree is more appropriate for winter months and a cotton saree is more suitable for the summer season. Next is, always get extra fabric for your saree, so it can be worn in any style you want and the more the flare the saree will have, the fancier it will look. 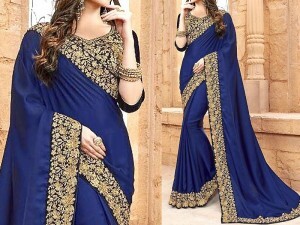 You can always find good quality sarees at affordable price tags that will look luxurious and expensive, as compared to other styles of dresses, so if you are on a budget, saree will be the best option for you. If you have a plain saree dress, you can get your desired embellishment for the blouse to give it a more rich look that will be perfect for any formal or semi-formal event. Lastly, there are different fabrics of saree that look more expensive than other ones, so instead of splurging on a heavily embroidered georgette or chiffon saree, get a fine print banarsi or silk one, and they will give you the same results. If you are looking for latest saree designs 2019 from Pakistani saree designers then you are on the right place, as PakStyle.pk features multiple saree dresses in elegant designs and colors. Place your order online and pay cash on delivery with free home delivery nationwide!